Today, we are comparing Motorola’s upcoming device G7 with the Motorola One Power. The comparison is based on specifications and features. 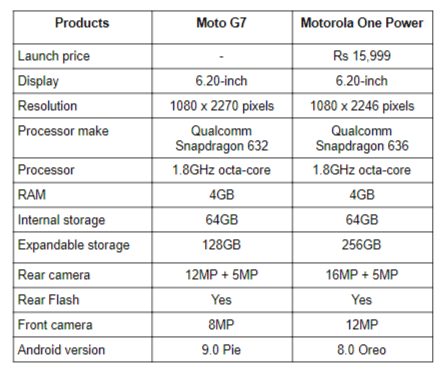 The Motorola has announced the launch of four new smartphones in its G-series lineup in India recently. The smartphones are expected to launch in India this year very soon. The Moto G7 will come with a Qualcomm Snapdragon 636 processor and will feature a dual camera setup on the back. On the other hand, we have Motorola’s other device “One Power”, which is the first smartphone by the company that is a part of Google’s Android One program. So, let’s begin with a quick specs comparison of the two to know which device would be the right buy for you? The Moto G7 sports a 6.20-inch display that comes with a resolution of 1080 x 2270 pixels. On the other hand, the Motorola One Power also has a 6.20-inch screen that offers a resolution of 1080 x 2246 pixels. When it comes to the processor, the Moto G7 is powered by a Qualcomm Snapdragon 632 processor, which is paired with 4GB RAM and 64GB internal memory that is expandable to up to 128GB via a microSD card. The Motorola One Power is backed by the Qualcomm Snapdragon 636 chipset, which is slightly faster than the Qualcomm Snapdragon 632 in Moto G7. the device packs 4GB RAM and 64GB internal memory that is expandable to up to 256GB via a microSD card. As far as the cameras are concerned, the Moto G7 features a dual 12MP + 5MP camera setup on the back that comes with an 8MP sensor on the front. On the other side, the Motorola One Power sports a dual 16MP + 5MP rear cameras and a 12MP sensor on the front. The Motorola One Power is launched in India at a price of Rs 15,999. The phone is also a part of Google’s Android One program, which means this device will be among one of the first ones to receive updates early directly from Google. On the other hand, the Motorola G7 is expected to launch in India very soon and expected to lie in the mid-range segment. However, there is no official confirmation came from the company yet.